Did you know that you have your own amazing and wondrous energy system running through your body? Your energy system is the life force that beats your heart, allows you to grow and evolve, and energizes all the organs and systems in your physical body. Therefore, it is a key component of overall health and wellness. Wellness is much more than the mere absence of disease. The most inclusive definitions of wellness consider the optimal functioning of all aspects of our whole being: body, mind, spirit, emotions, and energy. The emerging field of energy medicine addresses this energy level of our beings. Energy medicine is one of five domains of ‘complementary and alternative medicine’ identified by the National Center for Complementary and Alternative Medicine. Examples of energy medicine include Reiki, acupuncture, and EFT (Emotional Freedom Technique). While the study of energy medicine is relatively new in our Western culture, it has been practiced for ages in Eastern cultures which have long understood that we all possess a life force energy variously called chi, qi, ki or prana in different traditions. Whatever we call it, this is the energy that fuels our aliveness. And when our energy system is optimally functioning, we can enjoy a greater sense of well-being and wellness. Chakras are a core part of our energy system. ‘Chakra’ is an ancient Sanskrit word that translates as ‘wheel’ or ‘disc.’ Chakras are not seen in the physical body because they are fields of energy. 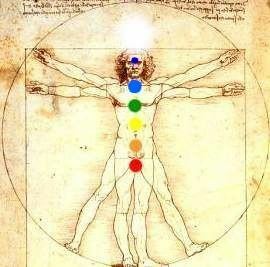 We have seven main chakras which are believed to be spinning spheres of bioenergetic activity. Chakras are stacked vertically in a column of energy that begins at the base of the spine and moves upward to the crown of the head. 1st Chakra: Root The root chakra (red) is found at the base of the spine. It corresponds with the adrenals, kidneys, spinal column, colon, and legs. The root chakra provides grounding, stability, and security. It relates to our physical needs and survival. 2nd Chakra: Sacral The sacral chakra (orange) is located in the lower abdomen area, below the navel. It relates to the sexual/reproductive organs, spleen, bladder, and prostate. It is associated with sexuality, giving/receiving, creativity, and desire. 3rd Chakra: Solar plexus You can find the solar plexus chakra (yellow) in the stomach area, above the navel and, below the chest. It connects with the pancreas, stomach, liver, gall bladder, and nervous system. This is the energy center of our personal power, will, commitment, inner strength, and self-esteem. 4th Chakra: Heart In the center of the chest is the heart chakra (green). It corresponds to the heart, thymus gland, circulatory system, arms/hands, and lungs. The heart chakra relates to love, compassion, forgiveness, balance, and intimacy. 5th Chakra: Throat As you would suspect, the throat chakra (light blue) is located in the throat area, at the neck above the collar bone. It relates to the throat, mouth, thyroid, and hypothalamus. This is our center for creative self-expression and our voice for speaking truth. 6th Chakra: Third eye The third eye chakra (dark blue) is located in the center of the forehead. It corresponds to the brain, pituitary gland, nose, and ears. This is our energy center of insight, inner wisdom, intuition, and higher vision. 7th Chakra: Crown The crown chakra (purple or pure white) is located at the top of the head. It relates to the upper brain, central nervous system, and pineal gland. The crown chakra is associated with spirituality, connection with our highest self, enlightenment, and unity. Understanding your energy system is a step on the path to greater wellness. When your energy is balanced and flowing freely it supports your optimal happiness and well-being. This wellness is reflected in positive attitudes and behaviors and in how you respond to situations, problems, and relationships.